Energic factory at Villefranche sur-Saône 2015. 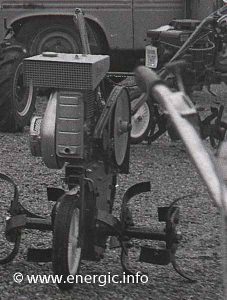 Japan entered the agricultural equipment sector in 1964. This was a very important point in ETS Patissier history. It made Ets Patissier look a there core business and ranges of equipment. A decision was made to diversify into new area’s based on there strengths. (Between 1970 and 1976). In 1976 Mr André Patissier stepped into running the business full time. 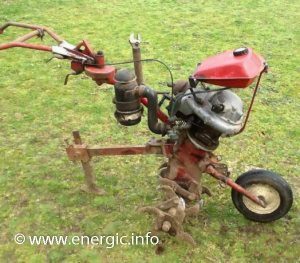 This was at the time of the decline in the Energic core marketplace, of tractors and motoculteurs, due to high levels of cheaper imported agricultural equipment principally from Japan and Taiwan. This was further exasipated by competition in the domestic French marketplace from larger French manufacturers. 1978 saw also a switch into supplying body panels for there previous tractor ranges and motoculteur parts. 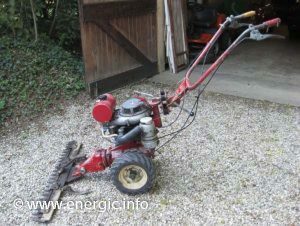 In the very late 1970’s onwards; Ets Patissier was also selling a wide range of associated products, imported and re branded that included Push mowers/Tondeuses, Chainsaws/Tronconneuses, Blowers/Atomiseurs, Trimmers/Debroussailleuses, Hedge trimmers/Tailleuses de Hales, along side there core business of Larger engined blade Grass cutters/Motofoucheuses, Rotivators/Motobineuses, and specialist High vine tractors/Enjambeurs (1976). A decision was made to stop producing motoculteurs and tractors in that period, and concentrated on sourcing and re-manufacturing motoculteur/tractor body parts and spares for existing and previous product ranges. 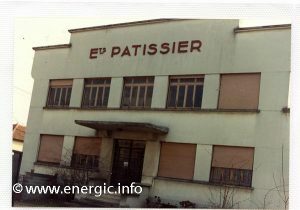 Ets Patissier also continued to manufacture the popular smaller motobineuse range, with annual sales of just 2000 machines. It was inevitable that this decline in production and subsequent reduction in sales and revenue made Ets Patissier vulnerable to the much larger mass production competition. 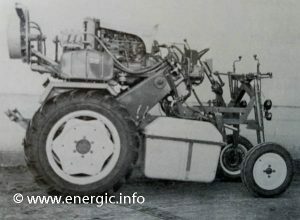 Some 70 employees lost there jobs from that period up till 1986, when the brand name “Energic” was sold and ETS. Patissier was closed its gates for the final time. This brought to a close over 40 years of successful ground breaking trading, with many industry firsts and innovations that held the Energic brand at the top of its markets for some 56 years. Mr Albert Patissier lodged and held over 40 French patents and 18 international patents in Tractors, Motoculteurs, Motobineuse and other associated mechanical products. A great innovator, engineer and entrepreneur of his time.